Gifts made by will are one of Regis College’s most important sources of individual support. The bequest may be in the form of cash, securities, real estate, tangible personal property, or other assets. 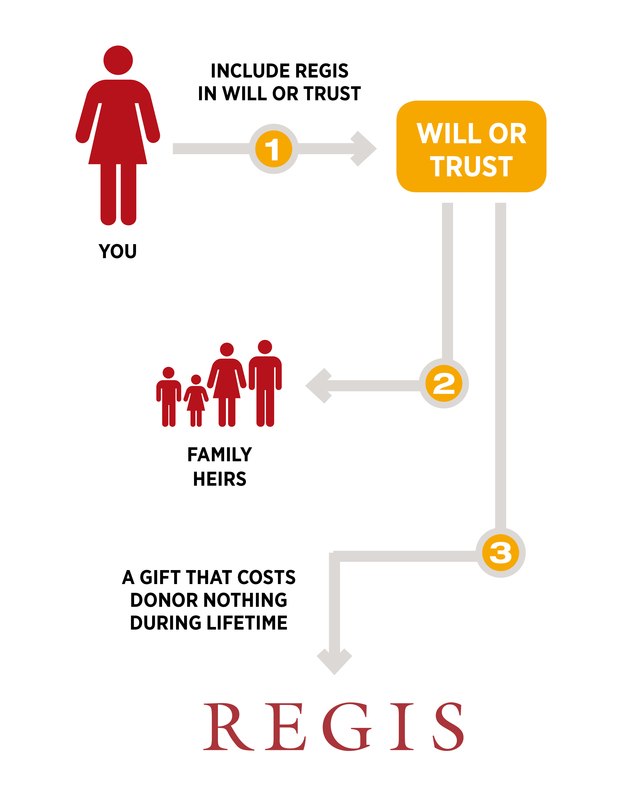 You may include Regis by creating a new will, adding a codicil to your present will, including Regis in your revocable trust, or designating Regis as a beneficiary of your retirement plan. “I give (the sum of $____) (the following described property:________) to Regis College, a non-profit corporation of the State of Massachusetts, to be used to further its purposes as the Board of Trustees in their discretion may deem appropriate.” For more sample bequest language, please contact Institutional Advancement at 781.768.7220. Download the bequest commitment form here. Cash Bequest: Donor gives a specific dollar amount. Specific Bequest: Donor gives specific assets, such as securities, an interest in real estate, or tangible personal property (e.g., works of art, antiques, etc.). Residuary Bequest: Donor gives all or a percentage of the remainder of your estate after the payment of any specific bequests and all estate-related expenses. Contingent Bequest: Donor gives a bequest only in the event of the death of other beneficiaries. Bequest to a Charitable Remainder Trust: One or more named beneficiaries receive income for life or for a specified term of years, after which time the assets pass to Regis. Retirement plan: Donor designates Regis College as a beneficiary of the remainder of an IRA, Keogh, tax-deferred annuity, or qualified pension or profit-sharing plan. Testamentary QTIP plan: The trust provides income, and principal if needed, to your spouse for life, after which a portion or all of the assets pass to Regis. Disclaimer – The information provided above is of a general character only, as the College and its personnel are not engaged in rendering legal or tax advisory services. For advice and assistance in specific cases, please consult with your attorney or other professional advisor. State laws govern wills, trusts, and charitable gifts made in a contractual agreement, and advice from legal counsel should be sought when considering these types of gifts. A bequest to Regis College is not subject to federal estate tax. The value of the bequest is deductible in determining the taxable estate, and there is no limit on the amount of the deduction. A bequest will reduce the size of the taxable portion of your estate, and thus the size of the federal tax liability. The “cost” to the estate, therefore, is not the full amount of the bequest, but rather the net amount after taking into account the tax savings. Your heirs, accordingly, may benefit from the tax savings, while Regis benefits from the full amount of the bequest.